Timecode rapidly became popular and had its own TV performance on 19 May 1975 when it was recognised with an Academy Citation at the National Academy of Television Arts and Sciences Emmy Awards ceremony in Hollywood. This fundamental standard remained the bedrock of TV operations for over 4 decades. You can always spot an American broadcast engineer’s children at nursery school because they learn to count in drop frame timecode from an early age. The remaining 75% of the planet that uses integer frame rates finds this either quaint or unusual. Strange counting modes aside, it was becoming apparent that timecode was too course a measure to work in the digital age. It could not synchronise individual digital audio samples nor groups of audio samples unless they were an integer multiple of a frame rate. Neither could timecode synchronise many metadata elements that had no relationship to a video clock. Poor working practises were also making problems for timecode. Many proprietary caption and subtitle formats from the 1970s and 1980s never identified the underlying frame rate of the captions and therefore the time codes found within the file were often difficult to line up with the video because an original video at 24fps might be captioned at 25fps, 29.97fps or 30fps. It is often impossible to know the frame rate by inspecting the time codes found in the caption file. With the introduction of file based working, synchronisation that was accurate to the audio sample was now essential and therefore a new timing regime was introduced. Some systems used floating point numbers, but many resorted to defining durations in terms of a rational number called edit units based on the sampling rate of the underlying audio or video. For this reason, you find many MXF files with an edit rate of (30000 / 1001) where each edit unit is (1001 / 30000) seconds. This method is always exact and works for new frame rates like 90fps used for Virtual Reality, 120 fps or (120000 / 1001) fps used for High Frame Rate Video and any rate that has an exact representation. It also allows hardware designers to use integer counters which makes life (and chip real estate) easier. With the introduction of IP networks and IMF compositions we are becoming even more precise in the definition of timing and synchronisation and timecode is no longer the required timing and synchronisation mechanism. The IMF User Group (https://imfug.com) is about to publish its first Best Practise document that can be summarised as “Don’t use Timecode”. This means that everyone with a MAM full of timecode in / out / duration values needs to do a little thought before blindly applying them to an automated IMF workflow. It’s not hard, but you have to do a bit of thinking. 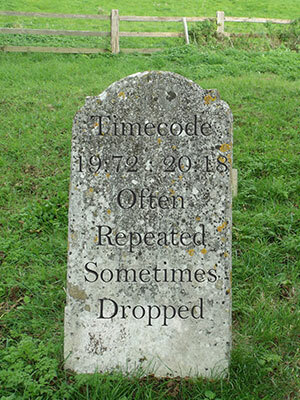 Timecode had a long, healthy and productive life. It’s time for it to rest in peace and move on. Good-bye timecode. Like the drop frame count of 00:02:00;01 you will be missed.